Mike in the aquarium tunnel checking out a sting ray. So this morning a bunch of people went to the Mall of the Emirates to go skiing at Ski Dubai. Mike Walsh and I decided that was not our activity of choice for the day so we hung back. We decided on a different adventure: the Dubai Mall. Yes, we have been there a few times before but this place always has something new in store. Before the Ski Dubai kids left, I snagged a couple coupons from the Entertainer Coupon Book. 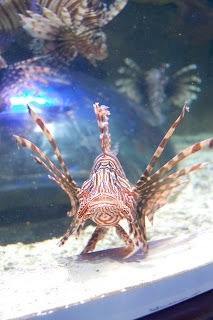 First stop: the Dubai Aquarium. In the middle of the mall there's this huge fish tank that is three stories tall and about 50 paces long. Coolest thing. We decided today we were going to use a coupon to buy tickets to see the underwater tunnel part of the aquarium. 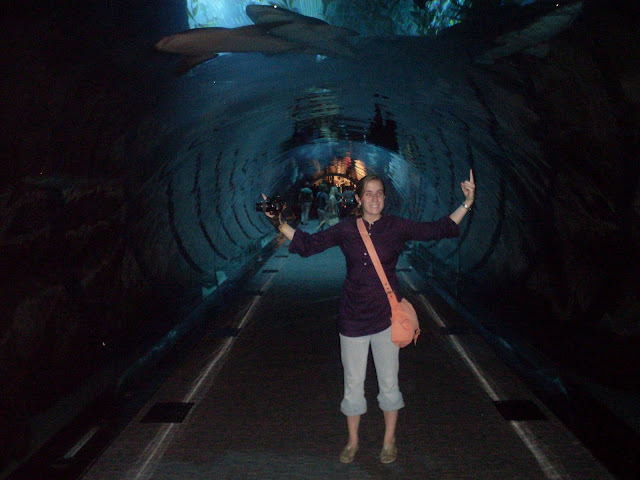 The tunnel was great, you could see sting rays, sharks, fish, plants, rocks, other tourists, even some reflections of the stores outside of the tank. Me standing in the Underwater Tunnel. Weirdest little animals ever. Water rats I think they were called. They were hilarious, just sitting all in a line munching away at their lunch. So funny!! Mike and the Iguana. The Iguana was eating his lunch, well actually he was just sitting on his lunch at this point. I have no idea how they did this, but this is a REAL LIVE SHARK FETUS on about the 80th day of growth. CRAZINESS. They had about 5 different stages of shark fetus growth. After the underwater zoo we headed to Yo! Sushi for lunch. Mike said the theme of the day was that we would look at all of the cool fish and then go eat them in sushi. Great theme! Best part about Yo! Sushi (yes with and exclamation point) is that the little covered plates of sushies come around on a conveyor belt!! Past all the tables through the entire restaurant!! You just see one you like and take it off the conveyor belt. The plates are color coded by price so they just tally up all your plates at the end. It was a great lunch. Apparently at one point we ate eel. Who knew! Mike at Yo! Sushi Check out the awesome table set up with the wasabi and soy sauce holders built into the table. One of the chefs at Yo! Sushi. 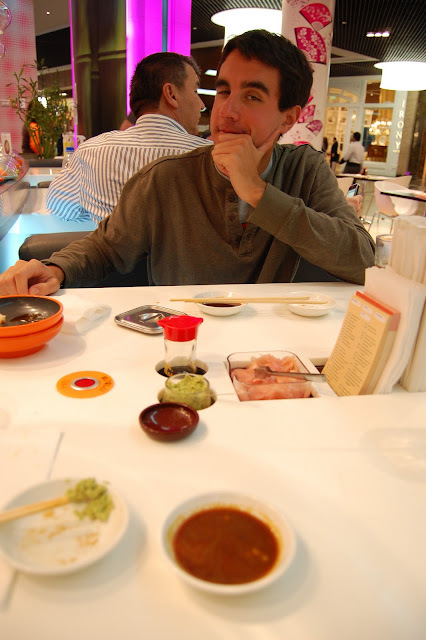 You can also see the sushi conveyor belt going by. Desert Safari Dubai Great place where you can enjoy your trip of Dubai.